This being the holidays, the Duchess of Kintyre has been traveling, leaving yours truly the Duke with very little to occupy his time except with thoughts of her. So the duke did what his typist does, and decided this was the time to try some new technology to absorb him! 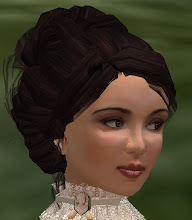 The first night of the duchess's departure, the Duke read with great interest about how the Guvnah of Caledon was now holding title in Caledonia, an entirely new virtual land in an entirely new virtual world, Blue Mars. Blue Mars is very very very different than Second Life. Moving is different, there are only about 1.5 avatars and three shirts to wear, but .... one gets the sense of being a pioneer. The fact the the Guvnah, clearly a smart man in virtual worlds, appreciates Blue Mars for its potential intrigues me much. Rather than risk my own personage, I dispatched Giordano, the Disgrace to Caledon Kintyre. Gio is the fellow who is creating that very odd alchemical library in the summer cottage basement that he doesn't think anyone knows about. I thought, well, if he gets swallowed up in Blue Mars, no great loss. He has found it fascinating, and in fact, without authorization, approached the Govnah in hopes of obtaining title to some sort of embassy of Kintyre in this new land. Gio sends these pictures to give some hint of just how different the place, and he, looks. One thing I like about Blue Mars is the idea of building things in a program and then importing them into the virtual world. So I taught myself some basic Google Sketchup over the last few days, and thanks to a couple blogs including one from the same smart folks who built Caledon, some tutorials and kind advice from Governor Shang himself, I did get a bookcase in ... though a trifle large. Ah well. So Kintyre will follow the progress of Caledonia and Blue Mars with great interest. The one thing the Duke awaits breathlessly is whether the Duchess' computer is able to access Blue Mars. If it's not, you may see backstepping worth of a professional dancer! Two typists in Second Life reflect on life's lessons through their avatars: Life in First Life, and Life in Second Life. A Methodist Minister ... in roleplay. Planter Leitner is usually found in one of two places. 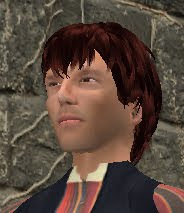 In the present, he is the Duke of Caledon Kintyre. In the roleplay Black Hills of Dakota Territory in 1878, he is an actor and impresario with a fondness for singing badly rhymed songs. Blitzer is the library director of the Deadwood roleplay sim. The modern library has contemporary reference materials; the other library, set in the roleplay area below, has only materials published in or before 1878.